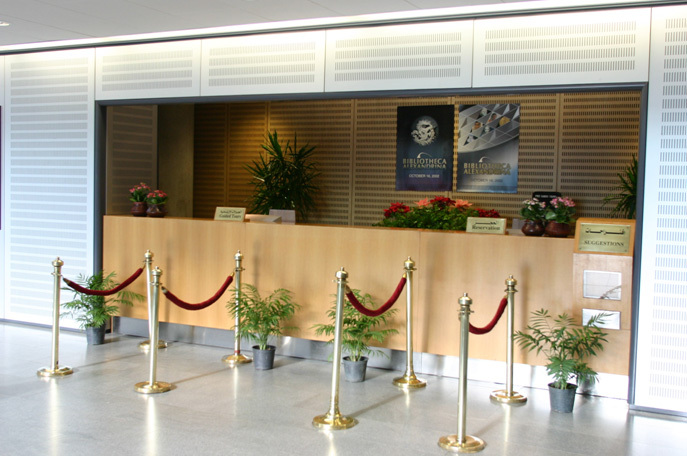 The Guided Tours Desk is located in the Foyer of the Library of Alexandria. Tours are being offered in the following languages: Arabic, English, and French. The Receptionists are responsible for prior reservation either by phone, e-mail or personal contact for individuals and groups. Kindly notice that the entrance tickets include guided tours and exhibitions. Reservations should be made at least 5 days in advance. The Library Ticket does not include admission to the Planetarium Science Center. For Reservations please call ext: 2350. In case of visiting both the Planetarium and the library, please coordinate between the schedules of the two visits. You have to buy library tickets to attend the Culturama Show. Please contact the Visits Department in case of modifying the time or canceling the School Visit. Please be there before time of the visit to have enough time to buy the Library tickets from the tickets booth located at Port Said Street, next to the conference center. The Visits Department provides guided tours, for Families, Individuals and different Groups, every 15 minutes in different languages: Arabic, English, and French (according to the tour schedule below). Tours for groups from universities, companies and travel agencies can be provided, upon immediate request during the regular working hours, but it is recommended to reserve the tour two days in advance. Prior reservation is required for Friday and Saturday guided tours. To view the complete guided tours schedule durning Ramadan, please click here. The Visits Department consists of guides who have received intensive training to lead an entertaining, and an enlightening tour for the visitors. The tour begins at Demetrius of Phaleron Statue at the Library entrance. The guide starts by explaining to the guests the historical background of the Ancient Library and how it disappeared. The guide then describes how the revival of the project was launched, the phases of construction, and the description of the Library building externally. The group moves inside the Library to the glass triangle known as "Callimachus Triangle" to see an overwhelming view of the Reading Hall while the guide explains everything about the Library and its components. The guide then highlights some ICT projects of the Library. The tour then reaches the Exhibition Halls on B1 to visit some of the permanent Exhibitions. Our guides carefully highlight the masterpieces found in these exhibitions. The duration of a regular tour is about 30–45 minutes. Prior reservation is highly recommended on Saturdays. All public areas are wheelchair accessible. The Reading Area is equipped with elevators and ramps on each floor to facilitate wheelchair movement. Wheel chairs are available at the Visits Reception Desk.